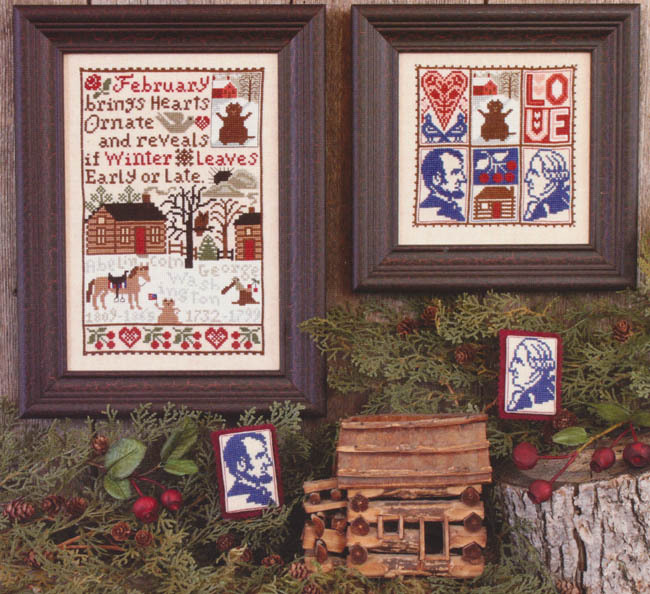 Nice winter sampler "February brings hearts ornate and reveals if Winter leaves early or late." Also includes a design with 6 different patterns that can be used separately. George Washington, Abe Lincoln, LOVE, etc. When Prairie Schooler retired in 2018, Hoffman Distributing, the largest distributor of cross stitch designs to retail stores, purchased all of the remaining Prairie Schooler inventory. In addition Hoffman purchased the rights to reprint previously out-of-print, older Prairie Schooler Charts. This has made many nearly impossible to find Prairie Schooler designs available again. However Hoffman decided to change the format of the reprints from the sturdy leaflet form we are all used to, to chart packs with each page printed individually and shipped in a clear envelope. This has caused a lot of confusion to stitchers who are familiar with the original leaflet form. Please understand these are NOT illegal copies. These are licensed reprints - provided by Hoffman Distributing with permission of Prairie Schooler. In addition to the format change the suggested retail price of the reprints has been raised to $12 for most items. Condition: Chart pack published by Hoffman Distributing. Please keep this in mind when purchasing Prairie Schooler designs so your are not surprised or disappointed when you receive your design.